The longest night of the year dawned this morning gray and wet. 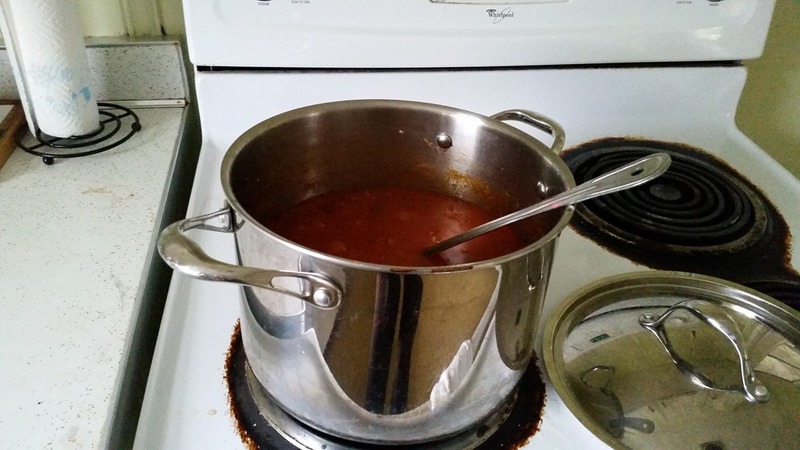 After breakfast a pot of chili seemed a good fix, so I put that on to simmer all morning for lunch. I then put Iolanthe in for a soak. I finished the knitting last night. 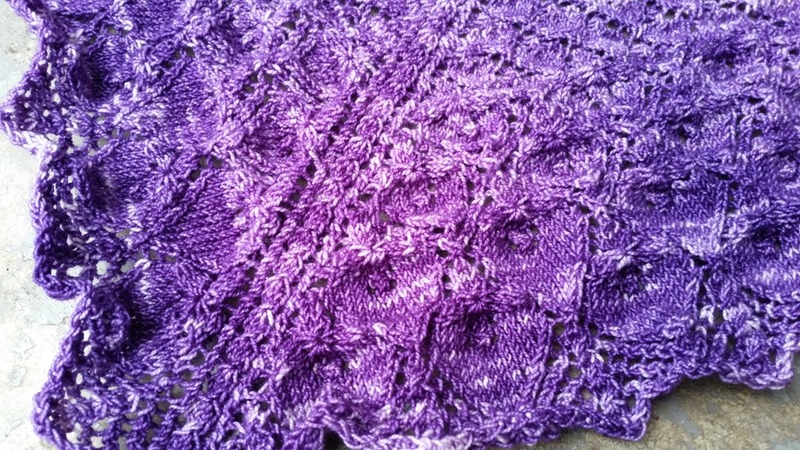 According to my Ravelry project page I started this shawl on November 20 and finished December 20. One month! Really? This thing just fell off the needles. I can’t remember any other shawl that I knit this fast. AND I knit three hats (2 fair isle) and a cowl during that time!?!? Impossible, but there it is. The stitch pattern was interesting and very intuitive so that I only had to refer to the charts to keep up with where I was and then knit the rows. Awesome pattern! Anyway I have a few shots of it unblocked which is pretty unimpressive since it is like a wrinkled mess. Wait until you see it later though. 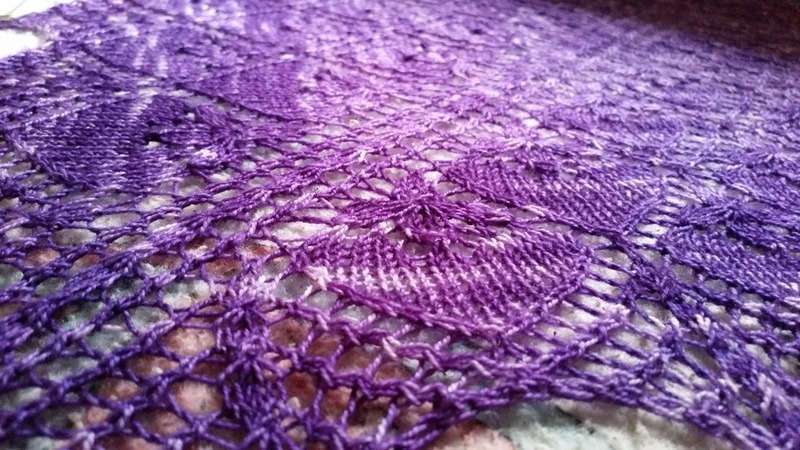 That is one of my favorite parts about lace knitting; that dramatic change after blocking. The light is crappy but I tried to get you a few blocking shots too. 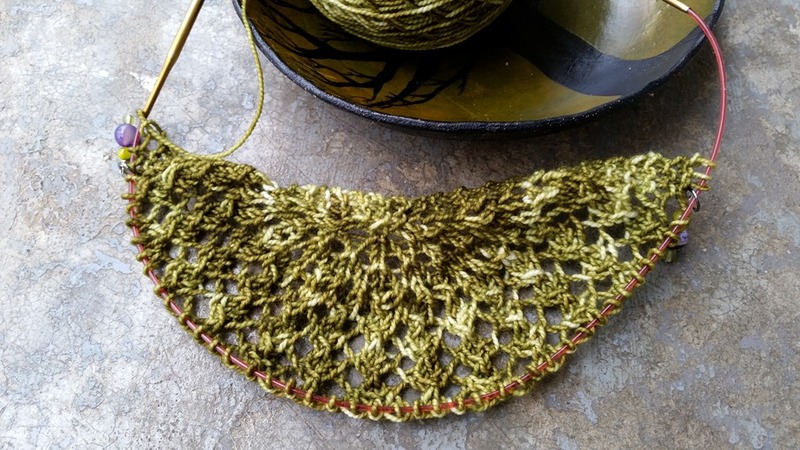 Oh, and while all this was going on I excitedly cast on for Culpeper Shawl which I planned to cast on about a month ago but the momentum of Iolanthe knitting and the Christmas knitting kept me occupied and now I can devote my full attention to it. This one is also going to be a fun knit. It is a Pi Shawl design, only it’s a half circle rather than a full one. I haven’t done one of these believe it or not and I am finding it challenging only in one aspect. 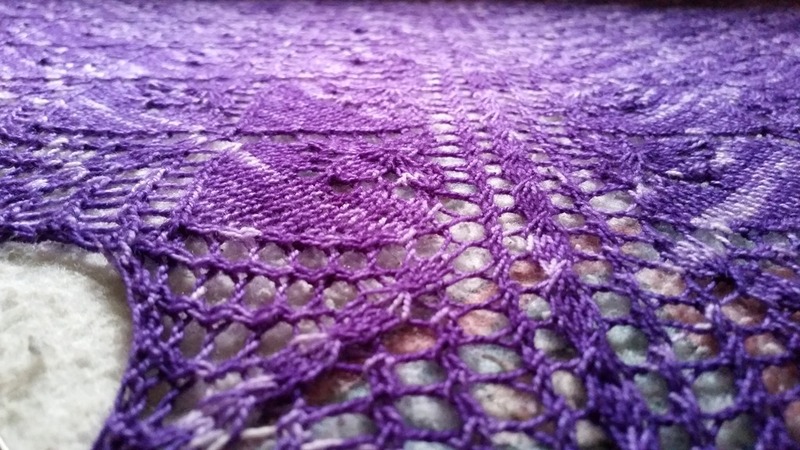 I have to continually fight the tendency to do increases at the beginning and end of the right side rows like you do when shaping triangle and crescent shawls. I have knit so many of them that the habit is very ingrained to expect those increases. With a PI Shawl you are only increasing dramatically every time the number of rows double (IIRC) which on this shawl after the set up section is whenever the chart (stitch pattern) changes. I easily got the set up section and Chart 1 knit while the lunch was cooking. It is smelling pretty good around here right now so I had better get the cornbread in the oven to go with the chili. Next post will have some progress on Culpeper no doubt plus final off the wires pictures of Iolanthe. It may be a challenge with all the gray rainy weather forecast this week though.